A party of 31 including seven veteran Skins, accompanied by the Colonel of the RDG, the previous and present Regimental Secretaries, the ‘Courier’ Captain Alan Henshall and some widows and family members set off from Ouistreham on Monday 24 August 2009. It was ‘beau temps’ all the way to Bourneville and back for the 65th anniversary of the Liberation. The visit began with Arromanches and the extremely powerful video where the thunderous sound track made even hardened veterans jump, you could hear the tiles cascading off a roof, and it closed with a reminder of the terrible losses the Americans endured on Omaha Beach. 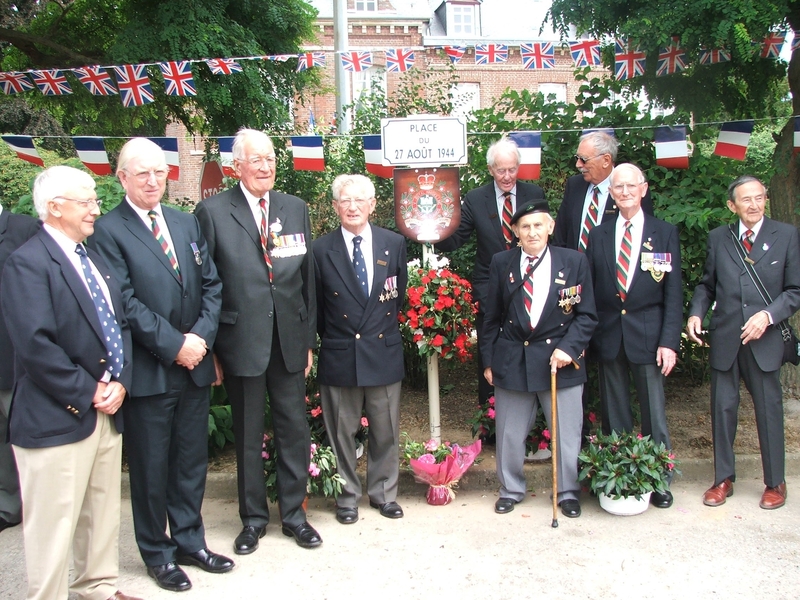 The museum paid tribute to all who took part in the D Day landing, who included our brother regiment the 4th/7th DG. We drove past the turning to Port en Bessin on Juno Beach where the Skins had landed in July ’44. South of Bayeux we passed Jerusalem Cross roads where Patrick Leavey was killed talking to his 4th/7th friends. The topography of France has changed in 65 years, with motor ways galore. Even with Jim Boardman’s running commentary, as a Normandy troop leader I hardly recognised any of the ground. We began with ceremonies at Caumont and Cahagnes where speeches were needed. Then to Courvaudon and a meeting again with Oliver McTiernan from Lisbellaw. We laid a wreath on the grave of Lieut Cornwall, an Irish Guards subaltern whose father had asked for him to be buried there. Driving south of Villers-Bocage where the Sharpshooters, our predecessors in 7th Armored Div had a damaging time, we passed Aunay sur Odon, last seen totally flattened, now rebuilt. I remembered well the scorching hot August day when we took on Mt.Pincon with the 13th/18th and won a battle honour. We spent a very comfortable night at the Chateau de Baffy Colombiers and dined well. A wreath was laid on the 4th/7th memorial at Creully. Tuesday saw us at Pegasus Bridge captured in the night by a glider ‘coup de main’ led by Major Howard. Knox Chapman of the Skins, serving with the glider regiment was a member of the team. The old bridge dwarfed by the new, is in the excellent Museum grounds, and we saw the bust of Major Howard and the new bridge rose for a passing vessel. On our route to Lisieux we were able to visit the St.Desir Cemetery where Grieves, Elson and Turner are buried. A wreath was laid, and then we drove on to Lisieux. The Basilica is world famous, and St.Therese has been in the news lately. Recce veterans will remember the many steps to the viewing platform, where Jim Boardman took a close view of the enemy. We were royally received by the Mayor Monsieur Bernard Aubril and treated to a vin d’honneur. ‘Your struggle was not in vain, thank you for giving us the happiness of living in peace’. (if the photograph is printed it can name the veterans). We spent the night at the Novotel in Rouen. It is a matter of fact that the narrow hidden bridge over the river Risle, found by Sgt Archie Carr of A Squadron was used by the entire 7th Armoured Division. We all walked down and were surprised by the width of the river at that point where a new bridge has been built. After St Georges du Vievre Jim took us for a walk through the woods on a route that only he remembered to Boissy le Chatel. They had organised a treat for us by holding the ‘vin d’honneur’ in the Chateau de Tilly a superb restored Renaisance turreted chateau, with the remains of fortified towers in the park and some stunning brickwork on the frontage. Bourneville on Thursday was the ‘piece de resistance’. We had scarcely finished laying a wreath in the cemetery, when we assembled in church for a Memorial Mass taken by Father Eric Ladon. Ushers in mediaeval tabards led us to our seats and the Regimental collect was read in English and French by veterans. At the war memorial Gerard Reine asked me to repeat ‘Mort pour la France’ some 50 times after the French and English names thereon. Thierry Chion, our man in France, had laid on an exhibition of photographs of characters in the regiment. We were reminded of Bill Bradfield who was decorated for his part in the liberation. At a ceremony a square was named ‘Place 27 Aout’. The Senator for the district, Marc Vampa was present and spoke. The day finished with a memorable meal and a gourmet’s delight of an iced pudding. On behalf of the Regimental Association of the Royal Dragoon Guards we would like to thank the Big Lottery Fund for their generous donation to our trip, fore without the fund many of our veterans would not have been able to attend this last memorial visit on the 65th Anniversary of operations. That sounds like a lovely trip. My reason for commenting, though, is to find out about the Jerusalem cross roads. My great uncle was a carrier driver and it was his final objective on one day shortly after D-day. Can you tell me where it is, and any other information as I have my uncles story but not what unit he was in. Were you able to locate Jerusalem Crossroads. I stumbled on to it in 2006 and can dig up the exact place where the cemetary is by the very same crossroads.